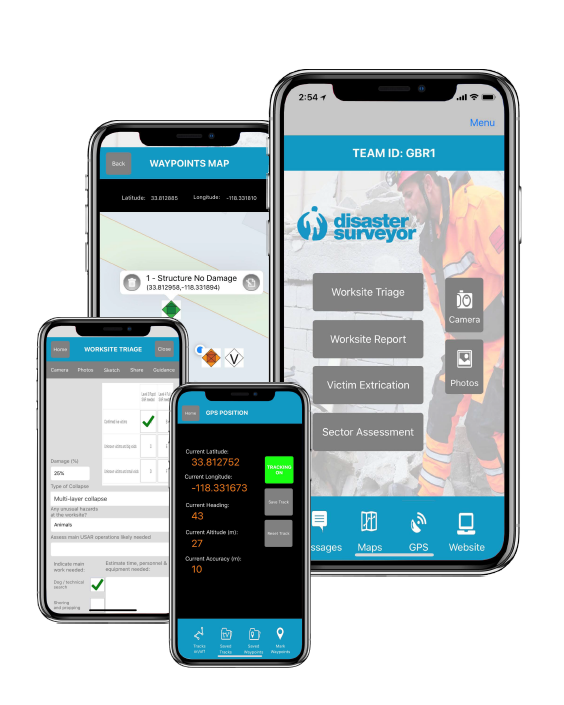 Disaster Surveyor makes today’s urban search and rescue field data collection and reporting process efficient and centralized. Our web-based disaster management tools give team leaders the ability to view all in-progress work to gain real time situational awareness. Master account to view all in-progress work to gain real time situational awareness while waiting for official vetted information to be submitted via current information exchange process. Expedited information download: Crews can upload information to the base of operations from the field in real time. Base technical information personnel can download GPS coordinates in multiple formats to include the INSARAG forms, vet information and upload to UCC (USAR Coordination Cell).